MANHATTAN, Kan. – Three marquee matchups on ESPN’s Big Monday, along with five Saturday home games, including each in the last four weeks of the regular season, highlight the Big 12 Conference portion of the Kansas State men’s basketball schedule released today (September 5). The Big 12 season tips off on Wednesday, January 2 when K-State hosts Texas at 8 p.m., CT and ends on Saturday, March 9 when the Wildcats host Oklahoma at 5 p.m., CT on Senior Day. Every team will get a “bye” during league play for the first time since the 2014-15 season. The Wildcats will have an open date between its road game at Texas A&M in the SEC/Big 12 Challenge on Saturday, January 26 and its road game at Oklahoma State on Saturday, February 2. The nine-game home slate includes five Saturday home games, a pair of Tuesday night tilts against Texas Tech (January 22 at 6 p.m., CT) and archrival Kansas (February 5 at 8 p.m., CT) and two Wednesday night matchups against Texas (January 2 at 8 p.m., CT) and West Virginia (January 9 at 6 p.m., CT). 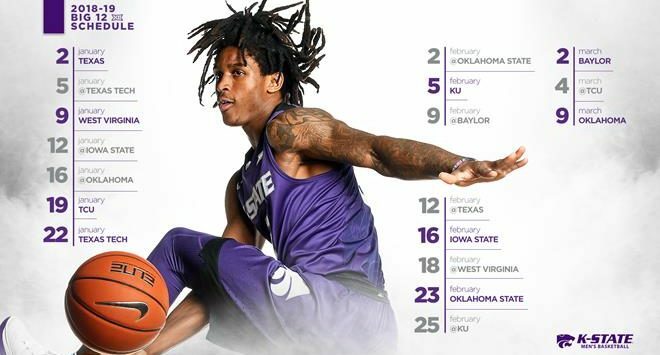 K-State will play on Big Monday three times in 2019 – all on the road in the last three weeks of the season – starting at West Virginia at 8 p.m., CT on February 18, continuing at Kansas at either 6 or 8 p.m., CT on February 25 and concluding at TCU at 8 p.m., CT on March 4. It marks the second-most appearances on the Big 12’s marquee game of the week broadcast in school history, following the four matchups in 2011. In all, the Wildcats will play 16 of their 18 league games against teams that advanced to the postseason a year ago, including eight at Bramlage Coliseum. In addition, five of the nine home league contests will also fall on a Saturday, including the last four of the regular season. These Saturday matchups include NCAA Tournament participants TCU and Oklahoma, NIT participants Oklahoma State and Baylor and regular postseason participant Iowa State. All 18 conference games will be broadcast on one of ESPN’s family of networks, including a number of matchups on ESPN and ESPN2. At this time, it appears that all 18 games will be on either ESPN, ESPN2 or ESPNU. Highlighted by the opener with Texas on January 2, K-State will play four of its first seven Big 12 games at home. This includes visits by NCAA Tournament participants West Virginia on Wednesday, January 9 (6 p.m. CT), TCU on Saturday, January 19 (3 p.m., CT) and Texas Tech on Tuesday, January 22 (6 p.m., CT). The road schedule includes a visit to Texas Tech on Saturday, January 5 (1 p.m., CT) and back-to-back visits to Iowa State (Saturday, January 12 at 11 a.m., CT) and Oklahoma (Wednesday, January 16 at 6 p.m., CT). Following a road game with Texas A&M in the SEC/Big 12 Challenge on Saturday, January 26, K-State will open the second half of Big 12 play with a road trip to Oklahoma State on Saturday, February 2. The visit to Stillwater will be the first of three road games in a four-game stretch, including back-to-back visits to Baylor (Saturday, February 9 at 5 p.m., CT) and Texas (Tuesday, February 12 at 8 p.m., CT). The only home game in that span is a visit by Kansas on Tuesday, February 5 (8 p.m., CT), which is the first non-Big Monday/Saturday rivalry home game since 2013. K-State will finish off the regular season with four consecutive Saturday home games beginning with Iowa State on February 16 (3 p.m., CT) and continuing with Oklahoma State on February 23 (3 p.m., CT), Baylor on March 2 (7 p.m., CT) and Oklahoma on March 9 (5 p.m., CT). During this span, the Wildcats will play its last three road games on Big Monday, including West Virginia on February 18 (8 p.m., CT), Kansas on February 25 (6/8 p.m., CT) and TCU on March 4 (8 p.m., CT). The Phillips 66 Big 12 Championship will be held Wednesday through Saturday, March 13-16, at the Sprint Center in Kansas City. It will mark the 10th consecutive season that the Championship has been played in Kansas City. Returning All-Big 12 selections Dean Wade (16.2 ppg., 6.2 rpg.) and Barry Brown, Jr. (15.9 ppg., 3.1 rpg.) form the core of a veteran group returning for the Wildcats, who won 25 games and advanced to the Elite Eight for the 12th time in school history and the first time since 2010 in 2017-18. In all, K-State returns 10 lettermen in 2018-19, including six players who combined to start all 37 games. The Wildcats also return rising juniors Xavier Sneed (11.1 ppg., 5.1 rpg.) and Makol Mawien (6.8 ppg., 3.4 rpg.) as well as point guards, senior Kamau Stokes (9.0 ppg., 3.4 apg.) and sophomore Cartier Diarra (7.1 ppg., 2.0 apg.). Season tickets are currently on sale for K-State’s 16-game home schedule at Bramlage Coliseum. Fans have a variety of ticket packages from which to choose, including the Pick 5 mini plan. Tickets can be purchased toll free at (800) 221.CATS, online at www.kstatesports.com and/or in-person at the Athletics Ticket Office. The remaining game times as well as the third-tier television slate will be released in the coming weeks.